This beautiful Devlin design dress is just over 1 year old and is in excellent condition. Worn by a very slim, petite 12 year old therefore would most likely suit a 10-11 year old child or even younger. 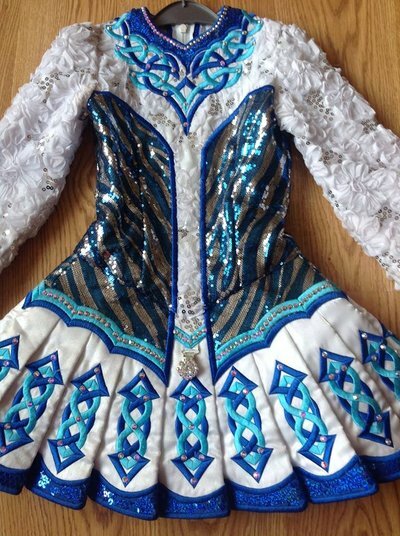 The dress is very structured in style and is very unusual as it incorporates both a 3D embroidered sequin white mesh chiffon design floral fabric as well as a geometric sequin bodice so really sparkles on the stage. The fabrics and embellishments were specifically sourced for this dress from the garment district in New York City. 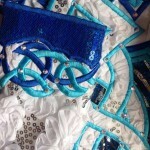 The colour palate is a royal blue and white and silver with turquoise blue as the contrasting embroidery colour. 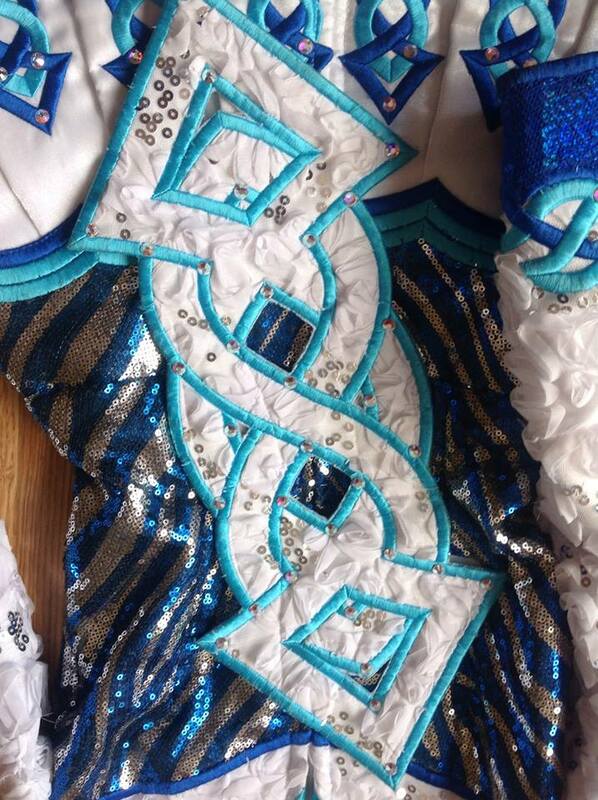 The overall design is geometrical with a celtic embroidery design on the chest. 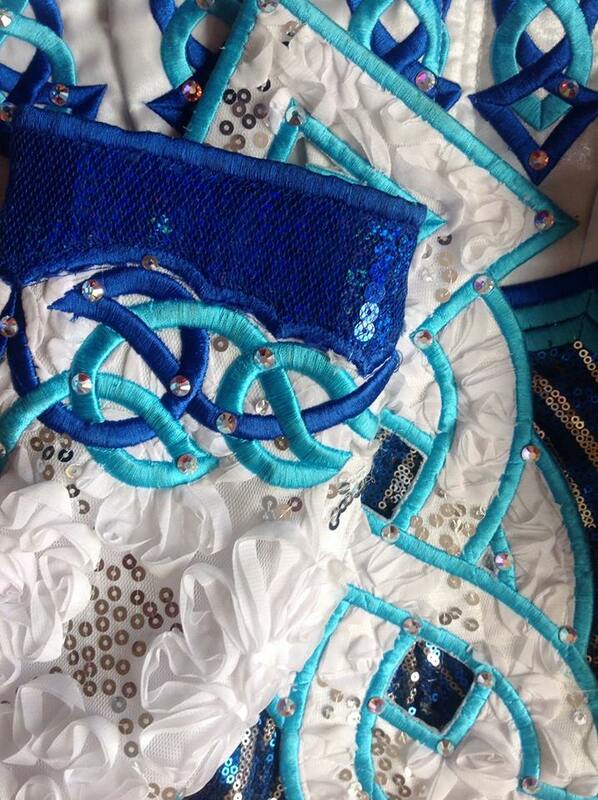 The skirt is a tennis style panel skirl with a Celtic embroidery and crystalled design on each individual panel. 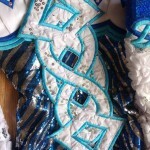 It has clear cutlines, a bold accents with small rhinestones/crystals at the neck and bottom of the bodice and on each embroidered area. The discrete sequins within the chiffon fabric really sparkle when dancing. The skirt is structured into large pleats of fabric to ensure it sits out. The back shawl/piece is a 3D design which mirrors the front geometrical pattern. A really striking beautiful dress. I am happy to send any additional photos on request. Asking Price: £450. Shipping costs are included for my own country, overseas shipping is extra. Returns are negotiable.